John’s Gospel for today is one that is well known and often discussed. The questions that arise, however distract us from the real meaning of the Gospel: What did Jesus write in the sand…and where was the man who was involved in the adulterous act? Both are interesting questions but they do take us from the heart of the Gospel which is the forgiveness, compassion, and love of God. 1) He may have wished to gain time; not rushing into a decision. 2) He may have deliberately forced the accusers to repeat their charges, hoping they would realize their cruelty. 3) Seized with an intolerable sense of shame, Jesus stooped down to avoid the leering lustful look on the faces of the Pharisees & scribes. The woman is released of the sin; she is not released from the requirement to change her ways. “Sin no more” involves asking for forgiveness. It means changing her behavior and her heart. It means having faith in God who offers grace to change one’s life; to turn from one’s behavior, to change one’s attitude and thoughts, to be converted in heart, soul and mind. Looking at an image of Jesus on the cross, meditate today on Jesus’ forgiveness of our sins. • Forgiveness and reconciliation involve letting go of anger, resentment and the desire for revenge. Do I do that when angry at another person? • Do I replay the offense in my mind, dwelling on it? • Do I pray for the one who hurt me, asking God to bless them? • Do I take steps to talk with them about the hurt? • Have I celebrated the sacrament of Reconciliation this Lent? There are still two weeks remaining before Easter! And/or have I asked forgiveness of the one who offended me? Sister, I think by writing in the sand, Jesus symbolically “rewrote” the Law of Moses. 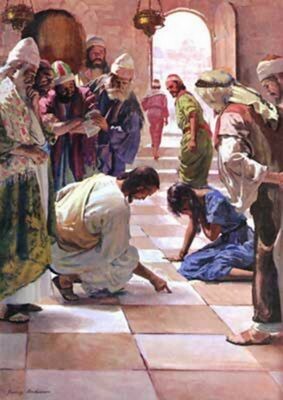 Father did mention in his homily about the writing of the sins of the accusers: this made public their transgressions just as the woman’s adultery was; where the accusers fled at the sight of their sins written out, the woman remained in the presence of Jesus with her sins evident, and with that humility they were forgiven her. Do we have a definitive answer to this gesture? Or just these theories? I like your blog very much. I find it informative mentally and enriching spiritually.